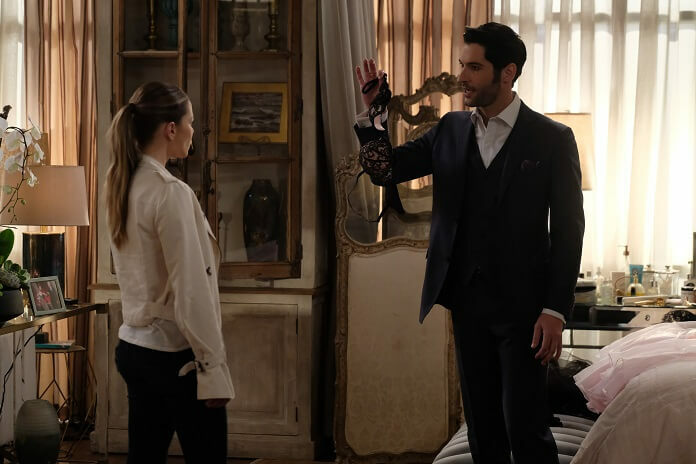 Fox’s Lucifer season three episode 21 kicks off with the death of a talented ballerina. Alone while practicing her routine, she’s attacked from behind and choked to death. The action at Pierce’s place picks up right where season three episode 20 left off. Lucifer (Tom Ellis) can’t believe Pierce’s mark is gone, with Pierce (Tom Welling) explaining his plan must have worked. He thinks Chloe’s love is what made his mark disappear, the same way Lucifer can bleed in her presence. Pierce admits he tried to stop her from saying she loved him, but Lucifer believes God took the mark away as a way to screw with him. However, Lucifer’s more than happy to kill Pierce at this point since that’s what he’s always wanted. Lucifer picks up a rock, says, “Let’s rock and roll,” and is about to do the deed when Pierce stops him. Chloe (Lauren German) shows up at work and it’s obvious to Ella (Aimee Garcia) that something’s wrong. Chloe’s wearing sunglasses at work and Ella figures out she’s been crying. Chloe admits she and Pierce broke up, but she doesn’t really understand why. It could be an intimacy thing and she blames herself, but Ella won’t let her get away with that. She wants to go yell at Pierce, but Chloe stops her. It was only a temporary halt in Ella’s mission as once Chloe walks away, Ella yells at Pierce anyway. He claims he broke things off so as not to hurt her but then he suddenly realizes he can now actually grow old with her. He wants to win her back! Ballerina Reina Markova was a prima ballerina who liked to rehearse alone. Ella estimates she’s been dead for 10 hours and Lucifer compares that to the time of death of Chloe’s relationship with Pierce. Turns out Reina was killed with shoelaces – but not her own. Dan (Kevin Alejandro) arrives and is happy to hear Pierce is a thing of the past. Chloe warns Lucifer that her relationship with Pierce is none of his business. She’s not sure if she’s taking Pierce back. As she’s walking away, she scratches Lucifer and he bleeds. He’s pleased to see the blood, believing it means he’s still important to Chloe. Lucifer barges into Dr. Linda’s office, happy Chloe still makes him bleed. He catches Linda (Rachael Harris) up on Pierce losing his mark and says that Chloe’s love is what makes him vulnerable and made Pierce vulnerable. If Chloe cares for them, they can be hurt or killed. But since he can still bleed, that must mean Chloe’s on the fence between he and Pierce. He needs to tip the scales in his favor to save her from Pierce. He decides that means he needs to show Chloe he’s better than Pierce in every possible way. Maze (Lesley-Ann Brandt) pays a visit to Pierce at work and he confirms they’re calling off their plan. He explains he broke up with her and he no longer wants to use Chloe. Maze doesn’t want their plan to end because her side of the arrangement has always been to hang Pierce’s murder on Lucifer which will wreck his life. It’s the only way she can get back to Hell. Pierce doesn’t care; the plan is off. A pissed off Maze leaves, but she’s not giving up on her plan. Lucifer brings Chloe a latte and a single lemon bar. Dan walks up, grabs a lemon bar from a full tray on Chloe’s desk, and munches away. He spits out what’s left when Ella arrives and explains Pierce baked them. Ella reports the ballet shoe had traces of olive oil, Evian, and beeswax. Lucifer jokes, “So the killer’s a bumblebee with expensive taste.” However, Chloe and Ella know ballerinas use different means to condition their shoes. Chloe and Lucifer head over and question Amber Fontaine, Reina’s understudy. (And, yes, that is Robert Roldan from So You Think You Can Dance as Miguel, one of the dancers.) Amber claims the killer must have stolen her shoes from her locker which was also Reina’s locker at some point. She claims she’s not ready to step into the spotlight and wanted to learn more from Reina. She then reveals Reina was going to host America’s Next Prima Ballerina but decided not to. Chloe thinks they need to find out why Reina turned down the hosting gig. When Chloe and Lucifer exit the studio, they discover Pierce has filled Chloe’s car with roses. That prompts Lucifer to meet with Amenadiel (DB Woodside) to devise a plan to get rid of Pierce. Amenadiel nixes any plan that involves killing Pierce, and then Lucifer decides killing Pierce isn’t the goal. The goal is for Chloe to pick him over Pierce, and Amenadiel’s all in on that plan. Lucifer believes they need to prove to Chloe that Pierce isn’t the man who she thinks he is. And then it slips out Pierce is the man behind Sinnerman, something Amenadiel didn’t know. Chloe and Lucifer interrogate Myles at the station and he doesn’t care Reina is dead. He calls her unprofessional and claims he didn’t want to work with her. Lucifer uses his Jedi mind trick to learn Myles wishes the car crash didn’t happen, confessing the car crash didn’t crush his leg. He admits the accident generated sympathy and made his career. He also admits he wears a prosthetic leg over his perfectly fine real leg. Myles received a video threatening to expose him unless he gave Reina a job, but it turns out Reina didn’t send the video. The video was sent from her email address and when he confronted her, she got angry and quit because she didn’t want any handouts. Charlotte (Tricia Helfer) is relaxing at a hotel, drinking and preparing for her eventual trip to Hell. Amenadiel stops by to ask her to help him prove Pierce was behind Sinnerman, explaining Pierce was leading a double life. He then explains he wants Pierce out of the picture so Lucifer can be with Chloe. Amenadiel lets Charlotte in on the secret that Chloe was placed on this earth to cross paths with Lucifer, and bringing them together is his final task. If he gets them together, God will restore him. Charlotte figures out that if she helps Amenadiel, it might put her in God’s good graces. She immediately springs into action. Maze is at Chloe’s place when Chloe wakes up. Maze apologizes and wants back in the house, saying she heard Chloe and Pierce broke up. She offers to hurt Pierce for her ex-roommate. Chloe admits she’s confused and then lays out what happened. She admits she doesn’t know what to think and doesn’t trust Pierce. Maze says she never trusts anyone. Trixie interrupts Maze and Chloe talking, and then immediately leaves the room. Dan calls Chloe with the news that the email with the video was sent from an address belonging to William Sterling, chairman of the board of LA West Ballet. Chloe heads over to the place to check it out and Lucifer’s already there because he wanted to take things off her plate. Sterling’s not there and Lucifer says an attractive neighbor let him in. There are photos of Sterling with Reina all over the place as well as her lingerie. Her old costumes are in the closet, too, and Lucifer believes this is all because Sterling’s a sicko stalker. Chloe, on the other hand, thinks it’s because Reina lived there with Sterling. Just then Sterling arrives and Lucifer’s immediately slams him against the wall. Chloe tells Lucifer to let him go because he and Reina were having an affair. Sterling claims Reina was the love of his life. Chloe asks if he sent Myles the blackmail video, but he denies knowing anything about it. Since the email came from this physical address, he thinks someone might have snuck onto Reina’s computer. Meanwhile, Amenadiel and Charlotte spy on Pierce as he sits with a known fence. Charlotte’s willing to do whatever it takes to find out about the envelope the fence hands to Pierce since she’s working with God. When Pierce leaves, Charlotte steals a motorcycle claiming she’s doing so for God. She races after Pierce and follows him into a parking lot. Pierce figures out he’s being followed and confronts her. Charlotte whips off the helmet and makes up a story about how she’s attracted to him and wanted him since he broke up with Chloe. He stops her, saying he’s in love with Chloe. Chloe, Ella, Lucifer, and Dan watch the video which exposes Myles’ lie. The video was on Reina’s computer, but they can’t trace who created it. If the killer wore gloves, they won’t get anything from Reina’s computer. Their discussion is interrupted by a call from Pierce. Lucifer tries to hit ignore but Chloe answers. They eavesdrop as Chloe talks to Pierce. He wants her to meet him at his place that evening, promising he won’t bother her again. Lucifer knows Chloe’s about to make a decision and asks if he can share some thoughts before she does. She agrees and tells him to spill whatever he wants to say. Dan and Ella continue to listen in so Lucifer asks her to meet him at his place in one hour. Chloe and Lucifer arrive at a performance and Miguel’s on stage. He got rid of Reina so he could be with her understudy, which is obvious to Chloe and Lucifer when they watch Miguel and Amber dance together. Sterling arrives and screams at Miguel for taking Reina away and then fires a shot into the ceiling. Chloe instructs Sterling to drop the weapon (he doesn’t) and Lucifer gets in between Sterling and Miguel. Lucifer believes Miguel didn’t want to kill Reina, he just wanted to get her out of the way. Sterling thought Miguel cared for Reina and Lucifer explains she was an obstacle to Miguel’s being with Amber. Reina found out Miguel blackmailed Myles to get her out of the company and onto the show, and she threatened to ruin his career. Miguel wouldn’t be able to dance in the company with Amber ever again, and he couldn’t let that happen. Chloe wants to know why Miguel didn’t tell Amber the truth, and Amber confesses she has feelings for Miguel. Lucifer addresses Miguel, telling him he could have had everything he wanted if he just revealed to Amber how he felt. Miguel’s placed under arrest and led away. Lucifer watches Chloe leave and realizes he also blew it by not expressing his feelings. After being stood up by Chloe, Pierce heads over to her place. After he leaves, Charlotte and Amenadiel look for the envelope he received from the fence. It’s on the table but it’s empty and they realize he took the contents with him. Amenadiel thinks they’re too late but Charlotte won’t give up. “You don’t quit when you’re doing God’s work,” she says.